Take your cupcake presentation up a notch with our Twist Top Cupcake Box Set. This unique six-sided box set is designed to hold a single standard cupcake. 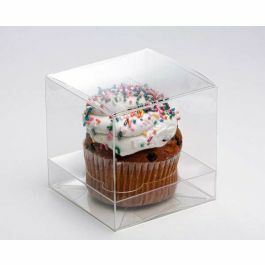 The set includes a 3 3/4" x 3 3/4" x 3 1/2" twist top box and clear insert to hold your cupcake in place. Shape along soft folded lines to assemble. Stickers are included. Food safe. Our Twist Top Cupcake Box Set makes a memorable presentation for frosted treats. Our CBS238 set includes a six-sided twist top box and a clear insert for a single standard cupcake. The box measures 3 3/4" x 3 3/4" x 3 1/2" and is easily assembled by shaping along soft folds. 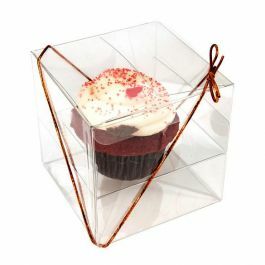 Customers will enjoy your cupcake from all angles in this unique box. The box is 12 mil thick and made of PET material for exceptional clarity. All materials are food safe. Stickers are included for a more secure closure. This twist top box is the perfect way to showcase your cupcakes and promote individual brands. Custom printing is available. Outer Dimensions: 3 3/4" x 3 3/4" x 3 1/2"
A popular use of CBS238 is to hold a single cupcake or muffin.